Tomorrow, Tucker will be 2 years old! Caroline and I decided that he would like a special fire truck cake for his birthday. I looked at some cakes online to get an idea of how to make this fire truck cake. Most of the ones I saw were very detailed and made by professionals. So, I stopped trying to find one to replicate as I was quickly talking myself out of attempting a fire truck cake. This morning the kids and I started making the cake batter from scratch. This is something that I have never done before because the box mix is just so easy. However, due to the snow and cold temperatures (9 degrees to be exact), I did not want to go to the store and have to get the kids out in the cold more than necessary. The vanilla cake mix turned out pretty well (there were some extra ends that I tested to make sure it was OK). Caroline and Tucker loved helping me mix the batter and add all the ingredients. 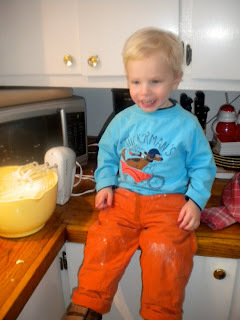 Caroline dubbed herself "egg girl" and Tucker liked to turn the mixer on and off. Once I got the batter in the pans they sat at the oven to watch cake bake. They were really cute sitting side by side in their matching chairs in front of the oven and amazingly well behaved...maybe we'll make a cake everyday! Mary, The picture of the kids watching the cake bake is the cutest picture ever!!! I love it! And the cake looked awesome. Good job!